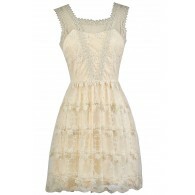 Exude a bounty of beauty in this GORGEOUS crochet lace dress! This dress is perfect for brides. The Bountiful Beauty Off Shoulder Crochet Lace Dress is fully lined. It has a beautiful oversized floral lace overlay. Underneath it has a layer of tulle which adds volume to the skirt. You will feel like the belle of the ball in this stunning dress. It has off shoulder straps, a sweetheart neckline, and a full A-line cut attached skirt. A hidden back zipper completes this dress. Pair this dress with your color choice of heels. 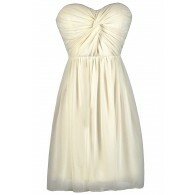 This would make a perfect dress for Wedding Rehearsal Dress or a pretty party dress. Details: Fully lined. Hidden back zipper. 100% polyester. Hand wash cold. Do not bleach. Do not iron. Small measurements: Length from top of bust to hemline: 29”. Bust: 32”. You have added Bountiful Beauty Off Shoulder Crochet Lace Dress in Off White into Wishlist. You have added Bountiful Beauty Off Shoulder Crochet Lace Dress in Off White for Stock Notification. 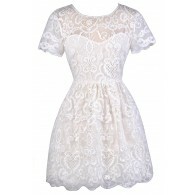 You have set Bountiful Beauty Off Shoulder Crochet Lace Dress in Off White as a loved product. You have removed Bountiful Beauty Off Shoulder Crochet Lace Dress in Off White as a loved product.